One of the most exciting attractions of Edenland Adventure Park, along with the activity of tree courses, are the tree houses. Completely functional, with great design, the tree houses offer you the ideal opportunity to enjoy being in nature at night, under the moon light, with your loved one, your friends or family. 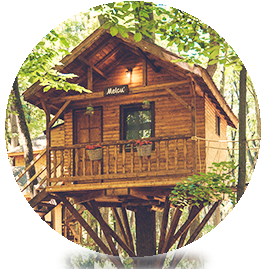 By their fairy-tale aspect and comfort, the tree houses make room for the fantastic to manifest and urge you to live magical nights far from the visual agglomeration and noise of the urban life. All the houses are built around the tree trunk, 4 of them being positioned 2 m above the ground and one on the ground, creating an atmosphere as in Tolkien’s books, making it an unique visual experience. No matter which one you choose, Casuta Soimu’ (The Falcon House), Casuta Ariciu’ (The Hedgehog House), Melcu’ (The Snail House), Closca cu pui (The Broody Hen with Its Chicks House) or Casuta din povesti (The Fairy Tale Cottage), Edenland offers you an experience in an outstanding world, in nature, enjoying the lively and changeable colours of the surroundings. 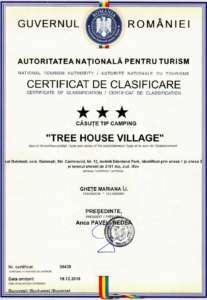 The tree houses are rented based on a hotel regime, with the check-in starting at 2:00 p.m. and the check-out at 12:00 p.m. They have a bathroom with shower cabin, heat in cold season and are equipped with a mini-cooler. They do not have a TV set. Smoking and vaping are strictly forbidden inside the tree houses, according to Law no. 15/2016 regarding the modification and completion of the Law no. 349/2002. Non-observance of the provision is sanctioned with a fine of 500 lei. Pets are also not allowed inside the tree houses. Reservation requires full payment in advance. For this, please fill out the form below. The fees are expressed in Lei and include 9% VAT. This message contains important information regarding the protection of your data with personal character. Please scroll to the end to be able to make an informed decision regarding the way we interact with you. On 25 May 2018, the General Regulation shall enter into force regarding Data Protection (EU) 2016/679 (GDPR). GDPR is an unique regulatory, directly applicable in all Member States of the European Union and replaced by Directive 95/46/EC and, implicitly, the provisions of the Law no. 677/2001 for the protection of individuals regarding the processing of personal data and the free movement of such data. Edenland Park apply a policy of privacy and security of personal data in strict compliance with the provisions of the GDPR, and as part of our commitment to respect the rights of the persons whose personal data we develop , we send you below some relevant information concerning the mode, the legal basis and the purpose, and also for how much time we develop your personal data, and also the rights you receive, and how you can exercise these rights. You can find more information concerning the protection of personal data applied by Edenland Park by accessing this page.